Sweet Ice: Dance Party This Friday! Lots of exciting things happening over here at Sweet Ice! First, we were featured in the Hamilton Spectator last week! Lisa Marr put together a lovely article that was in the Business section and focused on our Operation Shasta fundraiser. We had a great time talking with her about the campaign, and we went to Bennett's for a little Spectator photo shoot. Here are a few photos we took on our phones during our very short time at Bennett's. We were just so thrilled to enjoy our first snow cones of the season! Next exciting item: We have our first event of the season this week! And you're invited! 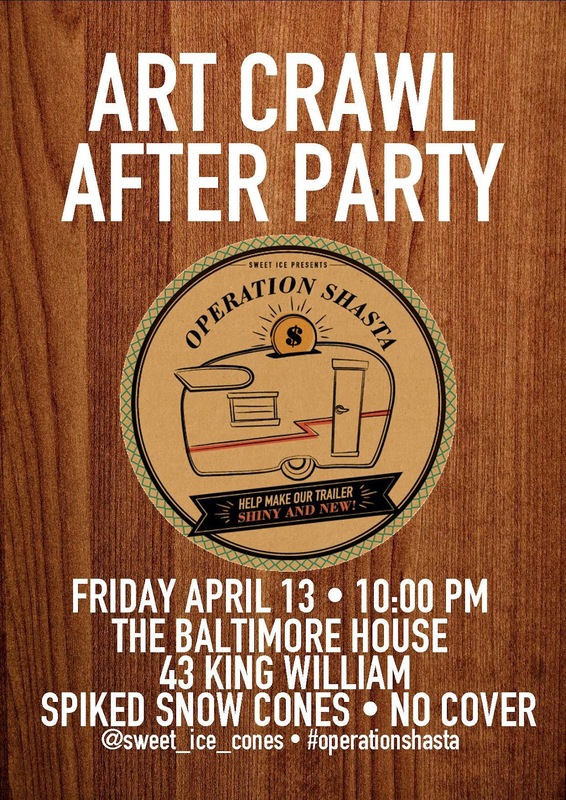 We're having an Art Crawl After Party at The Baltimore House on Friday. By that point we'll have about a week left of our fundraiser, so we're looking at this as a 'Success or Distress' party - we'll either be celebrating with you if we're close to raising our goal (SUCCESS!) or crying with you if we're not (DISTRESS!). It starts at 10pm, and there's no cover - all the more reason to indulge in some delicious snow cones! All proceeds from snow cone sales will go towards our trailer fundraiser, and we'll be pulling out some of our most popular spiked snow cones for this special event: The Apple Jack (Apple Cider Syrup + Jack Daniel's), The Daiquiri (Strawberry Lime Syrup + Rum) and the Margarita (Lime Syrup + Tequila)...YUM! Hope you (and everyone you know) can make it!